Travel north along the Alaska Hwy (Hwy 1), passing by the Dawson City turn-off (Hwy 2). Continue along until you see the Muktuk sign on the right side of the road. Drive one mile further until you see a blue sign with flags on top and a green street sign that says Husky Trail (Km 1443). Turn right and follow Husky Trail at a reduced speed for about 4 kms. This road will lead you directly into the Muktuk Ranch. 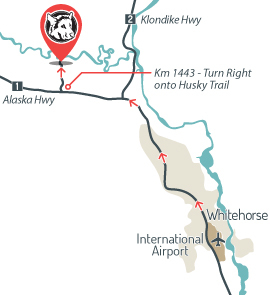 Driving time from downtown Whitehorse or from the Airport is approximately 20 minutes.